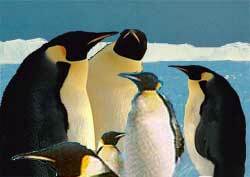 Millions of penguins annually return to their ancestral Antarctica colonies to rear their young. Some Antarctica colonies have hundreds of thousands of penguins. All penguin colonies fascinate, but the unique breeding behavior of the emperor penguin species in Antarctica captures the imagination. Unlike other penguin species, the emperor penguin female lays only one egg per year. After doing so, she gives the egg to her mate, and then slowly waddle-walks upwards of 50 kilometers (30 miles) to the sea to feed. Meanwhile, the male incubates the egg by himself. To keep the egg warm, he cradles it on his feet and blankets it with his special abdomen skin fold. He also preserves heat by closely huddling with his fellow egg cradlers. He does this for nine weeks. The female returns to take over at hatching. She begins the rearing process while the hungry male departs for the sea to eat (which he hasn't done in over 2 months). Once fed, he returns. And the incubation cycle continues. When the chick hatches, the parents more or less rotate the rearing and sea-feeding necessities until the chick is old enough to go to the sea and fend for itself.